The supercritical fluid extraction system (M/S Inexus) consisted of the following: high pressure CO2 pump capable of delivering carbon dioxide up to 200 g/min, chiller for circulating coolant through carbon dioxide pump head, co-solvent pump for the delivery of acetyl acetone dissolved in methanol, high pressure extraction vessel of 1 litre capacity, back pressure regulator and high pressure fraction collection vessel. 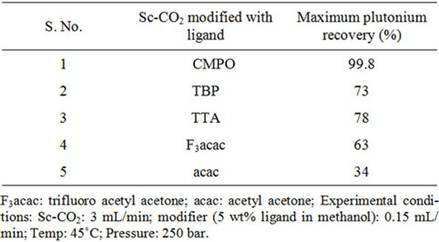 Carbon dioxide was delivered with a typical flow rate of 40 g/min whereas modifier (acetyl acetone dissolved in methanol) was delivered at a flow rate of 1 - 2 mL/min. Typical pressure employed for the recovery of uranium from cellulose waste was 200 bar and extraction was carried out at 50˚C. The extracts were collected in 0.01 N HNO3. The simulated uranium waste from cellulose, teflon and glass matrices was prepared by spiking known quantities (~2 grams) uranyl nitrate onto these matrices followed by drying at room temperature for about 24 hrs. About 90% volume of the 1 litre capacity extraction vessel was filled with simulated waste matrices. The uranium content in the extract and the remains were analysed by HPLC technique using reversed phase chromatographic technique . In our earlier studies, we have demonstrated complete recovery (>99 %) of plutonium in its Pu(IV) nitrate form from simulated waste matrices (paper, glass, stainless steel and teflon) using Sc-CO2 modified with 2 wt% fCMPO in methanol containing 0.16 N HNO3 under supercritical experimental conditions . Simulated waste containing plutonium stored for several months require addition of nitric acid for its effective removal. Supercritical fluid extraction of plutonium was subsequently carried out from actual waste, which was generated over a period of 5 years. However, the above SFE procedure, when applied to the actual waste resulted in only ~70% recovery, emphasizing the fact that the procedure needs modification depending upon the physical conditions to which the actual waste was subjected to as they are responsible for the degree of interaction with tissue paper matrix. The incomplete extraction behaviour suggested a possible chemical binding between cellulose present in tissue matrix with plutonium. In our earlier studies, we have established evidence for the enhanced chemical interaction of actinide ions (e.g. uranyl nitrate) with cellulose and dextrose matrix. The cellulose is polyhydroxy compound, which can possibly interact with plutonium/uranium and form compounds through exchange of “H” in the hydroxide group. Thus the poor extraction of plutonium present in the long-time stored cellulose waste can be attributed to the possible formation of some non-extractable species. Hence investigations were carried out in the present study to overcome the plutonium-matrix interaction as well as to convert the plutonium into its soluble species, nitric acid was added to the modified Sc-CO2 phase; similarly, nitric acid was also sprinkled onto the matrix prior to the extraction of plutonium. 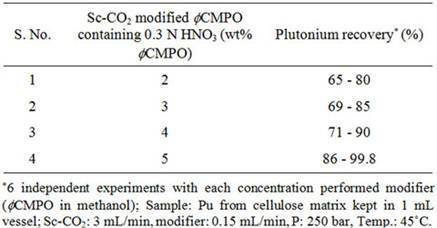 To improve the plutonium recovery from waste matrix, extraction efficiency was investigated as a function of 1) ligand and its content in modifier; 2) HNO3 content in mobile CO2 phase; 3) temperature; and also 4) extraction time. Table 1. Recovery of plutonium from cellulose based waste matrix; (a) Influence of fCMPO concentration; (b) Influence of HNO3 concentration; (c) Influence of ligands. Sc-CO2 modified with 5 wt% fCMPO in methanol containing 0.3 N HNO3 was employed. Sc-CO2 modified with TBP resulted in a maximum plutonium recovery of about 73%, whereas extraction with TTA resulted in a recovery of about 78%. Extraction with trifluoroacetyl acetone resulted in ~63% recovery whereas extraction with acetyl acetone resulted only in about 34%. 25 independent experiments were performed to establish the extraction efficiency of plutonium from waste using Sc-CO2 modified with fCMPO. 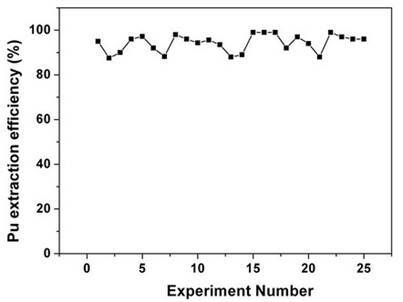 The extraction efficiency was found to vary from 88% to 99.8% in these experiments, averaging about 96% (Figure 1). The total amount of plutonium in the cut-piece (4 × 10 cm) was varying from 10 mg to 60 µg. Hence fCMPO was chosen as the ligand for the recovery of plutonium from the bulk cellulose waste. The extraction efficiency of plutonium recovery from cellulose matrix was also studied at 45˚C, 50˚C and 55˚C; similary, extraction was also carried out at pressure 200 and 250 bar; there was no significant change in the extraction efficiency of plutonium in these studies. The cellulose waste with plutonium was taken up in a 0.1 litre capacity extraction vessel and SFE was carried out using Sc-CO2 modified with 5 wt% fCMPO in methanol. The plutonium bearing cellulose waste was processed in five different batches; SFE was carried out for about 40 to 80 hrs duration; after every 5 hrs, the vessel was opened and fresh HNO3 (1N) was sprinkled on to the waste followed by SFE to improve the extraction efficiency. Typical result from a particular batch is shown in Figure 2. About 30 mg of plutonium was recovered from cellulose waste matrix during these five campaigns. Figure 1. Recovery of plutonium from actual cellulose waste matrix using SFE. Experimental Conditions: Sc-CO2: 3 mL/min; modifier (5 g fCMPO and 1.8 mL 16N HNO3 in 100 mL methanol): 0.15 mL/min; P: 250 bar; Temperature: 45˚C. Extraction period: 2 hours; Extraction vessel capacity: 1 mL. Sample: cellulose waste containing plutonium. Figure 2. Extraction and recovery of plutonium from cellulosic waste matrix. Sc-CO2: 3.5 mL/min; modifier: (5 g fCMPO and 1.8 mL 16 N HNO3 in 100 mL methanol): 0.15 mL/min; P: 200 bar, Temp: 50˚C, Extraction vessel capacity: 0.1 litre; Sample: cellulose waste containing plutonium (~3.5 mg of plutonium was recovered in this batch). i.e. only a maximum flow rate of 3.5 mL/min was employed with the existing SFE facility. 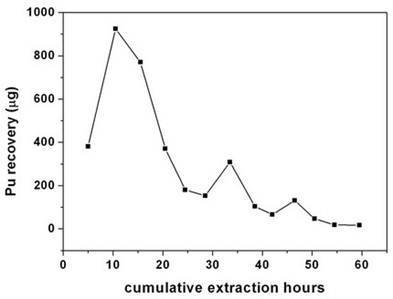 Extraction kinetics was found to be slow because ~30 minutes are required to affect one CO2 change in the extraction vessel. A facility for higher flow rates e.g. 25 - 50 mL/min is essential for a faster extraction and recovery. The delivery of fCMPO into CO2 phase in the absence of co-solvent, e.g. methanol results in further reduction of secondary liquid waste, an added advantage to SFE technique. It may be also useful to minimize the phase perturbation, if co-solvent (e.g. methanol) is not added, which will preserve the integrity of supercritical fluid phase of carbon dioxide. In our earlier studies  we have demonstrated the co-solvent free addition of various ligands to Sc-CO2 for extraction of metal ions. In the present study, fCMPO was added to Sc-CO2 and the modified phase was employed for the recovery of Plutonium from cellulose waste matrix (Figure 3). Near complete recovery of plutonium from waste was established in these studies from a 1 mL capacity extraction vessel. These studies have established the potential use of co-solvent free delivery of ligands for larger scale supercritical fluid extraction and recovery of actinides from waste matrices.